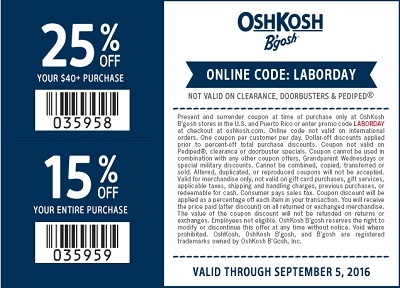 Labor Day Sale 2016 starts now at OshKosh B'gosh store location in the U.S. Entire store & site on sale! Receive up to 50% discounts on almost everything. Plus, you can save even more with printable coupon. Spend $40 or more and save 25% off your purchase. Or, spend less than $40 and receive 15% discount on your purchase. Show the coupon to cashier to receive the offer. Source of the information is OshKosh B'gosh. The offer is valid until September 5, 2016. For more details see any OshKosh B'gosh store location in the U.S. or OshKosh B'gosh official website.